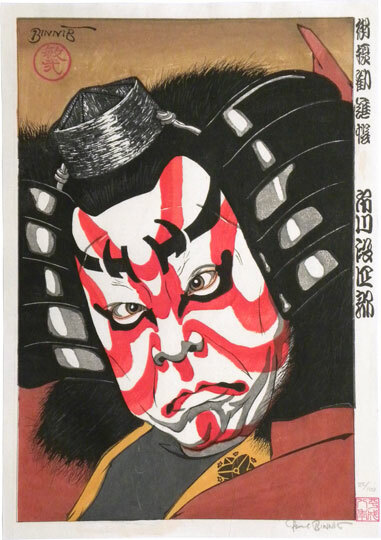 The Actor Ichikawa Danshiro IV (b. 1946) is in the role of Benkei from the play Gohi'iki Kanjincho (The Great Favorite Subscription List). The play is set at the end of the 12th century, following the defeat of the Heike clan. Benkei and his lord Yoshitsune sneak past a group of guards in the guise of priests. The beloved dance drama is still performed to this day, and was observed by the artist as he was composing this design.